Please note that 15% off coupon codes are valid for the purchase of e-books from museharbor.com. 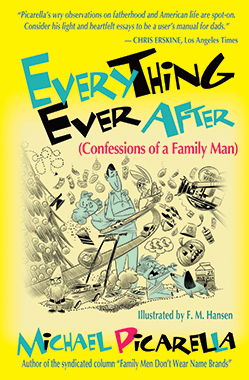 Paperback editions of Everything Ever After are available from Amazon.com at a discount. 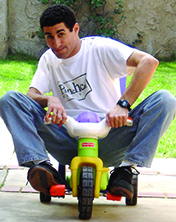 Michael Picarella shares 70 collected stories and a fistful of family bits from his Southern California-based columns, “Family Men Don’t Wear Name Brands” in The Acorn Newspapers and “Picarella Family Report” in The Signal. Picarella is a father, husband, columnist, filmmaker and cherry pie lover. He lives in L.A. with his wife, son and super beagle. Michael Picarella has been writing his family humor column, “Family Men Don’t Wear Name Brands,” for The Acorn Newspapers since 2006. He was a newspaper reporter and features writer for over six years, he worked as a marketing writer and director at Nappic Communications for several more years, creating, among many other successful marketing campaigns, a series of viral ads that was inducted into Marketing Sherpa’s Viral Hall of Fame, and he’s the writer-director behind the two highly unknown independent movies, 1 2 3 and Punchcard Player. Picarella paid a lot of money for his BFA from the Academy of Art University in San Francisco and he relocated to Los Angeles to make movies. Today, he still lives in Los Angeles with his wife, son, pet beagle and no more movies to his name (but still working on it). To read other stories, please visit www.michaelpicarella.com. Mike gets more money from the sale when you buy his e-book from us. Substantially more. But we also understand that you might want your purchase to appear on your Kindle, Nook, or iPad without having to transfer files. That’s okay. We just want you to read the book. And it’s the exact same book, whether you buy it from us or not: the same DRM-free content, for the same price (unless you have a Muse Harbor coupon, in which case it’ll be cheaper. Shhh! Don’t tell the others). The only difference is that when you buy the e-book from Muse Harbor Publishing, more of the purchase price goes to Mike, so that he can continue writing, and you can have more Muse Harbor books to read.